Drink in the fascinating history and warm hospitality of this fiercely independent destination, which has survived many challenges throughout its lifetime and is beloved by all who visit. Students will deepen their knowledge of Vietnam’s war-torn past as they experience a vibrant culture of floating markets, pulsating cities, picturesque villages, iconic natural wonders and fresh, flavourful cuisine. Cu Chi Underground Tunnels Explore the Cu Chi Underground Tunnels used by Viet Cong Guerrillas during the Vietnam War. Meet local students Interact with local students at the University of Foreign Language College. Mekong Delta Journey to the ‘Rice Bowl’ of Vietnam. Mekong River Boat Ride Discover floating markets, fish, fruit and orchard farms, and local family industries producing rice paper, fish sauce and coconut sweets, on a Sampan boat ride down the Mekong River. Traditional Sightseeing Be immersed in Vietnamese culture with visits to Cham Museum, Linh Ung Pagoda, Marble Mountain and Non Nuoc Stone Carving Village. Old Town Walking Tour Embark on a walking tour of the Old Town with visits to The Chinese Assembly Halls, Japanese Bridge and Ancestral family homes. Vietnamese cooking class Test your culinary skills in a traditional Vietnamese cooking class. Phong Nam Visit the ancient village of Phong Nam and marvel at the dramatic Hai Van Pass as you journey to Hue. Huong River Boat Ride Board a boat on the Huong River to visit Thein Mu Pagoda, The Imperial City and The Royal Palace. Music show Be entertained with a traditional music show. Tu Duc Tomb Wonder at the impressive Tomb of Tu Duc. Dong Xuan Market Haggle with locals at Dong Xuan Market. Ha Long Bay Take in stunning scenery and mystical limestone karsts as you cruise the UNESCO World Heritage listed Ha Long Bay. Explore the beautiful and majestic Thien Cung Grotto, Dau Go Cave and Hai Hing Village. Temple of Literature Appreciate traditional Vietnamese architecture at the Temple of Literature in Hanoi. Social & Science College Learn about the studies conducted at the Social & Science College. Water Puppet Performance Enjoy a world-famous traditional Water Puppet Performance. 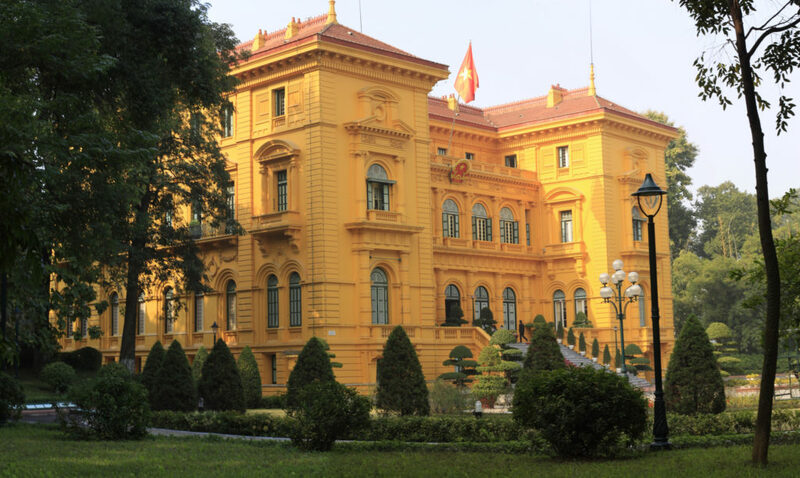 Ho Chi Minh Mausoleum Complex, Enjoy a guided visit to the Ho Chi Minh Mausoleum Complex, which includes Ho Chi Minh’s Mausoleum, Ho Chi Minh’s Stilt House, The Presidential Palace, Ho Chi Minh Museum and the One Pillar Pagoda. Thank you for your interest in our WorldStrides Spirit of Vietnam Tour! Please tell us a little more about yourself so we can get you sent to the right place.